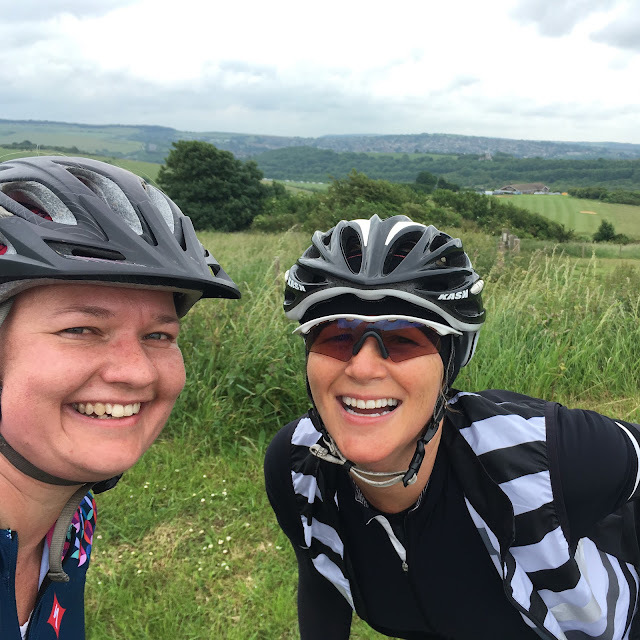 We were meant to do a ride from London to Cheddar Gorge with Strongher (a movement Marianne Vos and a whole string of other pros launched, their aim is to get more women to ride bikes) but unfortunately that ride got cancelled. Claire and I decided that we still wanted to ride, but that we didn't want to take on such a big ride by ourselves. I've only cycled to Brighton with the Heart Foundation back in the day on my first MTB with slicks that were too small for the actual wheels. Claire had an awesome route that she did with her club a few weeks ago so we decided we will do London Brighton and back to London instead. 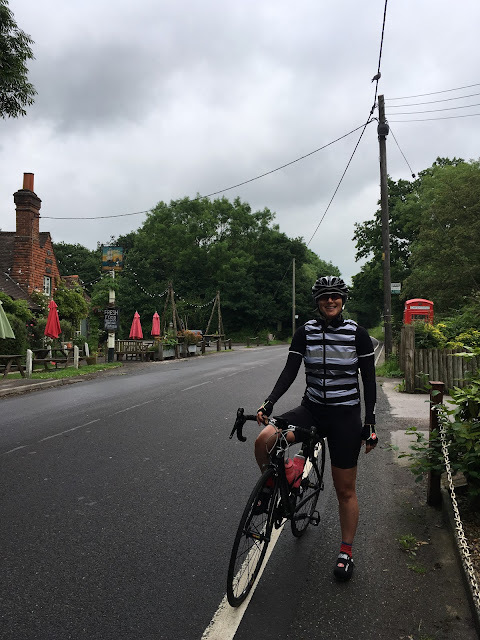 I left my house at 6:55 and met Claire in Leatherhead from where we cycled to join the route just before the back climb up to Box Hill. 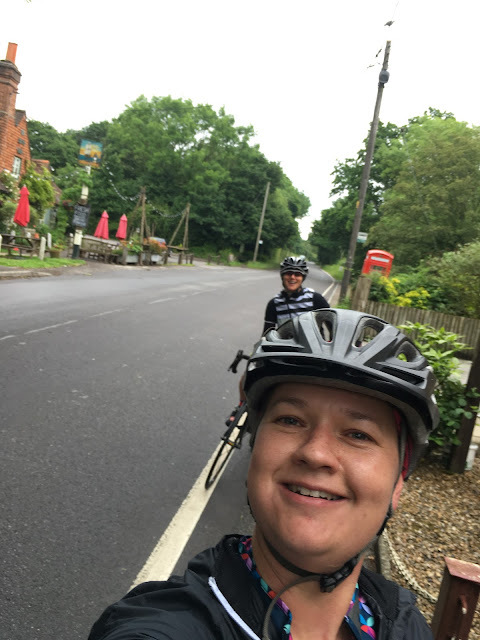 We cycled down to Betchworth, crossed the A25 towards Newdigate, Faygate and through the ever so quaint Rusper. The route followed quite country lanes and it was honestly such a beautiful ride, we missed the bigger towns. We saw village names such as Bucks Head and Colgate. Stuffing my face with potatoes off course! The route only got busier as we approached Devil's Dyke and as we dropped into Brighton. I have felt great all the way through and it was important for me to keep eating to make sure that I didn't run out of energy. We didn't stop for the normal fish & chips at the sea as it looked like a storm was brewing and we knew we still had some hard work to do. We stopped to fill up our water bottles at a pub in Shoreham-by-Sea, a visit to the ladies and bought a sandwich from the Co-op. I was fueled by my trusty salty buttered potatoes for most of the route. They are the absolute bomb! As soon as we past Shoreham we were back on quite country roads passing through sweet Steyning. The route back was hard work, the whole route actually. It was never really flat, it was always going up or going down, generally very lumpy. Claire and I each took our turn on the front and whenever I wanted to slow down a little, this voice from behind haunted me... "Get a wiggle on TC!" It was good to have the encouragement from behind as if I was on my own I would've just given up to freewheel a bit. We stopped a few more times as fatigue started to kick in. We were so delighted once we got back to Newdigate as we knew from there we only had to get to Dorking before it was the last stretch to Leatherhead. My favourite part was coming back towards Dorking from Newdigate along a long flattish drag. It was awesome just to go for it. 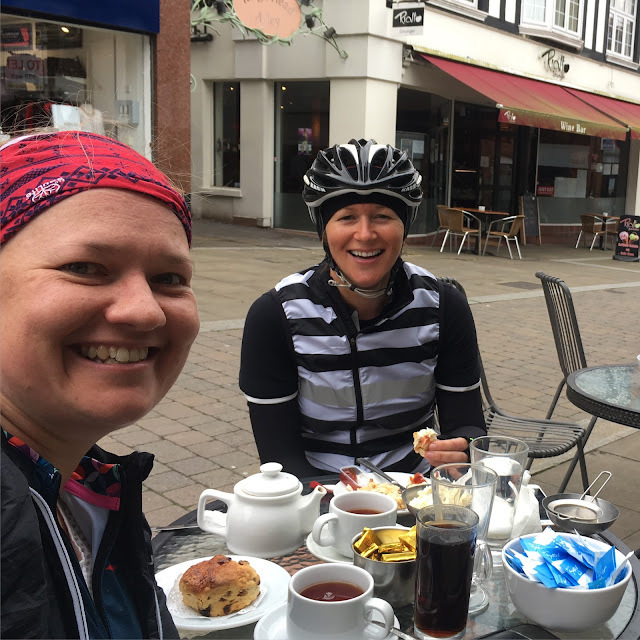 Once we arrived in Leatherhead we headed towards the nearest tea shop and treated ourselved with cream teas! I had an absolute ball and it was for sure my best day on my road bike so far. My lower body was tired after the ride, but I felt great considering the distance we covered. I have felt a lot worst after cycling before, so I think it could be one of two things, I either didn't ride hard enough or I am fitter than I thought at the moment. I don't care which one of the two it is though, as it was just so nice to cycle along beautiful QUITE roads with great company!